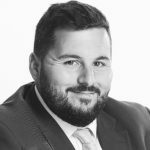 Fresh back from his trip to Europe’s O&M conference in Munich, I sat down with Scott Thomson, Senior Consultant for Solar & Storage, EMEA to debrief on his findings and unpack the most pertinent talking points from the meeting. We cover the pros and cons of in-house vs outsourced O&M, monitoring systems, the role of big data, and the organisational structures around the solar farm life-cycle. Hi Scott, what was the big idea behind the conference? The main thrust was to bring together key decision makers – CEOs, VPs and senior management – to develop and discuss ideas to develop O&M (Operations and Maintenance) services for solar farms. A lot of discussion over the 2 days centred around the pros and cons of managing O&M in-house or outsourcing it to an external contractor. We also talked about the factors to consider when selecting a subcontractor and what works best for each company. Solar asset management companies, asset owners, O&M contract managers and investments firms. Mainly people who own the assets and are looking to improve their current O&M strategy, and O&M managers looking for a way to better understand what the asset owners are looking for and what problems they are experiencing with O&M so they can improve their own service offerings. Can you describe the high-level structure of the industry and how these various stakeholders fit into the lifecycle of a solar project? Sure, the solar farm essentially has 3 main stages – develop, construct and O&M. And these phases are handled by different stakeholders at different times. Typically, Developers obtain land agreements and develop the project. Depending on their size, might also take on the construction, otherwise, they sell it to an Investment Company. Investment Companies invest in either operational assets, which are already built and up and running. Other investors, like Blackrock, invest in pre-construction so will acquire the asset before construction and oversee this phase. Then there’s the EPC (Engineering, Procurement, Construction) Company who builds the project. They produce the electrical designs and mechanical designs, they layout the fencing, the security, and choose what products they’ll use in construction – the panels, inverters, wiring, and cables. Often the EPC will commission the project and have it generating power, then operate and maintain it for a period of 2 years under warranty, before handing it over to an investment company or asset owner who will handle O&M either internally or through an external contractor. The asset owner, typically an Investment Company can split their work in different ways. Occasionally the investment company handles legal and finance, whilst outsourcing both O&M and Asset Management. More commonly, the investor will have an in-house technical team and need only to select an O&M provider or bring it internally. A few investment companies have their own investment managers, their own commercial asset managers, making sure that they get the most out of the asset financially. They’ll outsource asset management to a specialist company and outsource O&M to an O&M provider. Essentially, the developer develops the project, the EPC builds the project, and the asset owner or investment company owns the asset. Then there’s the asset management and O&M which are either outsourced or done in-house. There are a few peripheral players too like banks, who provide capital for the build, and equipment manufacturers who manufacture the kit. What big issues did the meeting aim to address? From the asset owner side, they create a tender and several O&M companies typically bid for the work. The tender will cover quality, cost, health & safety, and a lot of other variables. There was a lot of dialogue between asset owners as to which variables they put into play when considering an O&M provider. From the O&M service provider point of view, they were looking to understand some of the key things that aren’t working on a solar farm, with the aim of providing better alternatives. There was a lot each side could get out of the discussion. The most refreshing thing for me was that – when selecting an O&M provider, quality was at the top of everybody’s list of priorities whereas cost was closer to the bottom. It’s encouraging because people are prepared to invest to achieve the highest quality performance in their solar farm instead of focusing on cutting costs. A lot of companies talk about how to get the most out of your assets financially so it’s really good to see quality being balanced with commercial awareness. In fact, asset owners suggested that if O&M companies were too cheap, they became wary and questioned the quality that was being delivered. Response time was also a factor in terms of quality to help minimise any downtime and provide the best service possible. As a recruiter, how does Taylor Hopkinson contribute to this conversation? Ultimately, an investor wants to have the best-performing portfolio of assets, the best-performing solar farms. Our role is to source the best engineers, the the best O&M and Asset Managers to assist in the portfolio performance. One of our clients was awarded the best-performing fund in the UK, so it’s important to us that we understand the problems within the industry and help solve those problems by selecting the best candidates so that the portfolio runs to the best of its capability. It’s important for us to attend events like this. My speciality is in Solar O&M and asset management in Europe, which is a narrow niche. It really helps when we can contribute to this conversation and really understand the issues within the industry and learn more about our clients’ needs. To be honest, a few companies were surprised (pleasantly) to see us there. We’re also in a position where we can share a lot of knowledge with companies looking to grow their teams and expand into new regions or markets where we have experience. How different is O&M for wind vs solar? are the differences purely technical? I do have some experience in the wind sector and the best way to describe it is that wind uses large-scale rotating machinery. Although it’s very mechanical and complex, the industry has really figured out how best to handle O&M. In the opening session, Peter Raftery, Managing Director of BlackRock’s renewables team talked about the maturity of the solar and wind industries (their $40bn portfolio is split at 50-50 wind and solar). Solar has been deployed relatively quickly in the UK over the last 5-6 years so there are still some parts of O&M to get to grips with. Because wind farms take years to build, there is much more time to focus on O&M and get it right. Some providers will offer performance ratios while some asset owners will do that themselves. The performance ratio is one of the key variables – a silent factor if you like – of how well the solar farm is performing. Troubleshooting issues is also different in solar. A wind farm might have 5 or 6 turbines but a solar farm has thousands of panels and inverters. Using a monitoring system to find a faulty panel, and accessing that panel can be a lot more difficult and time-consuming compared to wind. What was the big conclusion from the conference? One of the key takeaways for me was from a presentation by somebody I’d placed with an old client a few years ago. He talked about bringing O&M in-house or outsourcing it and the advantages and disadvantages of both approaches. He now works for an asset owner, an asset management company with an investment arm. They have a large portfolio and as head of O&M, he is tasked with bringing 500MW of solar power internally by developing their own in-house team. there are no margins making O&M fees cheaper. Outside contractors subcontract work to other subcontractors and so on. Handling all this internally reduces these costs. You also get full control of your O&M system. You know exactly who is responsible and can minimise downtime that way. it requires a higher head-count which means recruitment, recruitment fees (if you use an agency), training plans, increasing HSE and risk assessments. Normally the asset manager is office-based, using remote monitoring software to manage things. Bringing O&M in-house means there are a lot more people on-site, which means there’s a massive increase in HSE. The main advantage of outsourcing is choice. With so many options, you can choose the most suitable provider for your business, based on the criteria that matter to your business structure. HSE is increasingly important as a selection factor and although, there are not as many accidents on solar farms as on wind farms where your working with large machinery, at height, often offshore, it’s an important consideration. Being able to check the incident record for providers means you can choose one with a good HSE record. You have to pay a margin which affects the returns of your portfolio. You have to monitor the quality of the work provided by the O&M provider. Although the HSE responsibility lies with the O&M provider, the asset owner is ultimately responsible for what happened on their site, so quality control is still important. 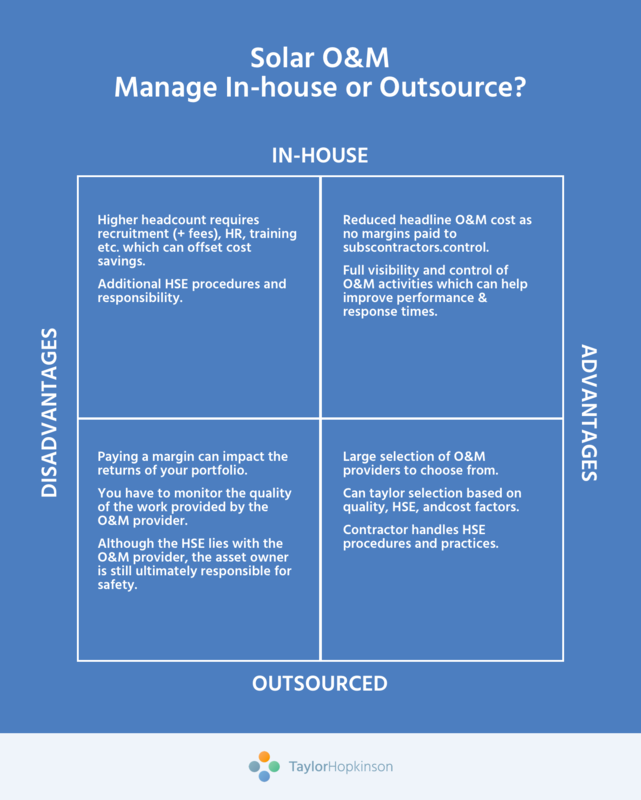 Ultimately, there’s no universal answer to the question of in-house vs outsourced. It really comes down to the way you choose to structure your business. What other important topics did you cover? Monitoring systems and big data were big topics of discussion. A monitoring system is a piece of software that an asset manager uses along with Excel and SCADA software from the office. But one of the problems is that there are almost too many monitoring systems to choose from. One way to improve the area would be consolidation through M&A where smaller companies can merge to provide a better quality and more competitive service. In fact, we share a building in London with one of these companies who found synergy through a merger. Monitoring systems can also have a slow learning curve where they take days, not hours to get up and running. And improvements in monitoring systems tend to be very linear. Companies could be much more innovative and stand out from the competition. Big Data was one of the key conclusions of the conference. If you’re an asset manager or an O&M provider and you’re using a software platform, how do you manage that data? How do you store that data? How do you monitor it and report it back to the owners or to your board? … How are your assets actually performing? Big data is emerging as a potential solution and will become more relevant over the next few years. There are so many factors that come into play when trying to build the best-performing portfolio. The key is to find what works best for your company, based an the factors that matter most to your business model.